« I was on national radio! 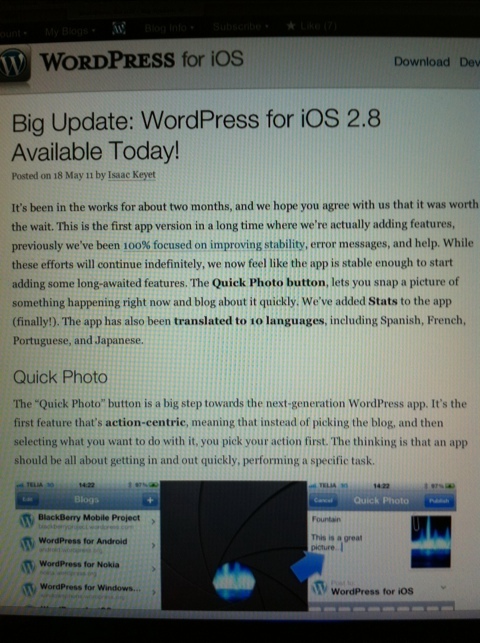 If this works as expected, the new WordPress iPhone app will make it much easier to post quickly and easily to blogs. For example, I’m now trying out a brand-new feature called Quick Photo. It’s the first action-centric feature to be added — and so far it is for iPhone only . The next time I’m at a Disney theme park I can see myself using Quick Photo whenever I’ll see something I want to show on this blog quickly. After opening the WordPress app I don’t have to choose which of my blogs I want to post to… just press the big button at the bottom of my list of blogs and, as the name implies, the camera is quickly launched so I can instantly take a picture then post it in a jiffy. A title and/or a description can be added (like I’ve done here, with this test photo of my MacBook screen showing an article about the latest version of the WordPres app) and then BOOM, it gets published and appears on the blog in almost realtime. For more details about this big update to the WordPress for iOS app, including more information about Quick Photo plus the new Stats and Localization features, take a look here.